Packaging and shipping present a great opportunity to increase brand visibility and enhance the customer experience. Yet many retailers overlook this opportunity, opting instead for plain unbranded packaging and shipping materials. While the basic criteria when deciding on a packing strategy is obviously to safeguard the product in transit, premium packaging offers a sure-shot way to differentiate the brand and boost customer loyalty. Following the adage “first impressions are lasting impressions,” the order fulfillment container plays a powerful role in forming a permanent impression in the minds of customers. A customized container that reflects the product within can go a long way in improving brand visibility as it makes its way around town to the buyer’s address. A case in point is Trunk Club. They ship their monthly subscription of clothes and accessories in custom printed packaging that features a handle to resemble a trunk. The unboxing experience of their product is always central to Trunk Club’s overall brand experience. Conversely, some e-retailers keep the outer containers plain purposely to prevent potential theft, maintain anonymity for buyers, or simply to be more cost-effective. While the extra investment in branded packaging has proven to pay dividends for many companies, the best strategy will always depend on the product within and the specific situation. While there may be good reasons not to spend extra money on branded outer packaging, there is seldom any excuse for not branding the inner packing. The type of packing materials will obviously depend on the nature of the product, but it pays to innovate, customize and brand it. Using custom shipping tape with the brand’s colors and logo makes the packing lively, adds to the branding and discourages tampering during transit of the product. Converting the inner packing into a reusable utility product, such as a reusable container, a themed gift wrapper, or a zip-pouch, is a great way to further entrench the brand in the mind of the customer while eco-friendly materials, such as non-toxic and biodegradable shipping peanuts, send a powerful message about the brand’s environmental consciousness. Finally, if the packet or box is attractive enough, the customer may even snap it and upload it to the social media, helping the brand gain valuable free advocacy. Adding on a small complementary gift such as a bookmark, sticker, keychain, etc., is a good strategy for gaining customer favor while simultaneously as spreading awareness of the brand image Unexpected add-ons serve to delight the customer and complement the overall brand experience. The cost to co-opt such add-ons is typically marginal, whereas the impact in terms of positive goodwill, and odds of repeat customer purchases is huge. Including samples of related products or an attractive and informative brochure can be a good cross-selling strategy. A postcard insert seeking feedback, application to join an exclusive club, a social media contest by sharing the picture of the packaging, a discount voucher for the next purchase, or simply sharing the brand’s origin and values, are all ways to leave a good impression and encourage more sales. Whenever possible, add a personal touch to the package with a handwritten note or a printed and signed thank-you card. If nothing else, personalize the packing slip with the customer’s name to generate a “feel good” factor among customers. Such initiatives render a personal touch to an otherwise impersonal process. Last but not the least, placement of the items inside the package as well as the order of presentation can also leave a huge impact. For instance, presenting a receipt upon opening the box may not be a good idea, always place it under the main item. While the possibilities are endless, never underestimate the power of simplicity. A neat, clutter-free parcel often leaves a better impact than a cluttered and heavy package. The best approach is to maximize the brand message even while minimizing the carbon footprint and reducing shipping waste. 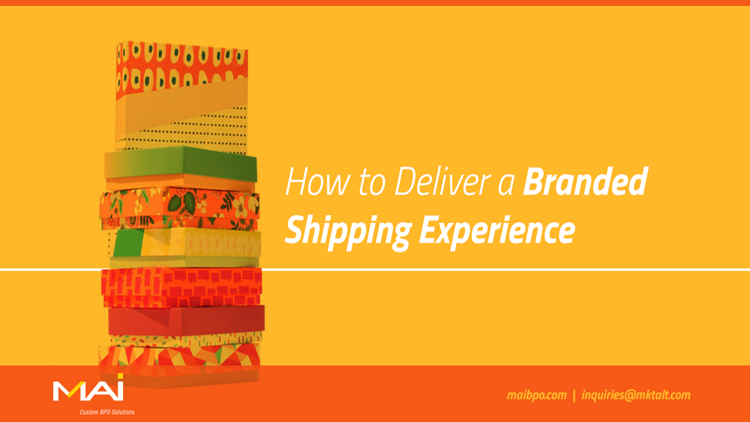 Shipping is now much more than merely delivering products to the customers. The packaging has become a catalyst to ensure customers loyalty and is an essential part of the integrated customer experience.